Villa Coco has a outdoor kitchen, sundeck and private pool and is walled-in for the couples who like to enjoy absolute privacy... .
Villa Coco is built in futuristic style. Inner space of the main bedroom can change its light depending upon your mood from romantic red and warm-yellow to cool-blue. One wall is fully made from mirror, the other is - from glass - it creates the feeling of space and comfort. The main bathroom has a double sink and 2 independent showers that make it possible to shower together. Additional small glass room can be used for massages, naps or as a bedroom for children. It has 3 glass walls and mirror ceiling and also has mood lighting. All the glass walls in bedrooms have transparent or black-out curtains. Half-open outdoor bathroom can be used during the day and for extra guests (children). Our location guaranties you piece and refreshment away from the hustle of South Bali. The villa consists of 2 buildings - the main building with air-conditioned large bedroom and bathroom. Next to this building there is a outdoor half bathroom and wooden deck with sun beds. The second building consists of a kitchen, dining area for 4 people and living room with a sofa and TV. Next to this building there is a glass air-conditioned room that could be used like a bedroom or a room for a nap. The villa has a kitchen, minibar, safebox in every bedroom, dining zone, bathroom, its own pool & sundeck. Drinking water, toilet paper, soap, shampoo, towels (for bathroom use and for the beach) are available to use. Villa Coco is away from city rush. This part of Bali is not touristic, that's why you cannot find here big malls, supermarkets and discos. This place more suits for those who wants to relax, be close to the nature, enjoy Balinese massages and atmosphere of slow Balinese lifestyle with its unique culture. There a couple of restaurants in walking distance and plenty of local small shops where you can buy drinks and snacks. The map, address and telephone number please check in chapter "Contacts". 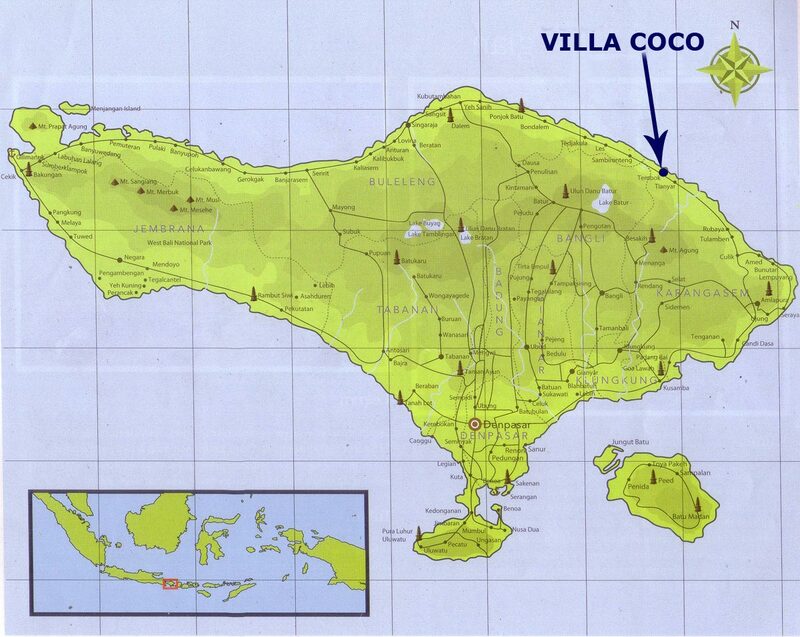 The rental price for Villa Coco is indicated in chapter "Prices". The amounts are fixed and include all the taxes. The main currency for payment is USD. All the payments for rent you can either transfer on our bank account (IDR, EUR, USD) in Indonesia or with the help of the credit card through PayPal +3.9% (after your enquiry we'll send you the invoice. For reservation for 7 nights and more you need to pay 50% first and the rest not later than a month before arrival. For reservation for less than 7 nights the full payment is required. For all the additional expenses that you'll probably have on arrival, such as car rent, meals, massages, diving, etc. you pay in cash (IDR, USD, EUR, AUD). You cannot pay it after check out or through PayPal. ATM is situated 15 minutes drive from the villa. If needed we can always help you to exchange your foreign currency into local one. The villa has its own territory, private pool and way to the beach. Private here means that no one else can use the pool or stay on the territory of the villa. The villa is fenced, so it gives you full privacy. The area is very secluded. Swimming naked in the ocean or in the pool is not considered offensive. As the area is quite secluded there are no taxis here. We do not recommend to rent a car without a driver, as in Bali the roads are very narrow, not many signs showing direction, many scooters, mountain roads, etc. All it makes it difficult to visit the places that you planned to see, driving you cannot look around to enjoy the beauty of the island and in case of the accident you need to deal with the local police. For transportation you can use a car with a driver, scooter (for short distances) or local bus (if you know exactly where are you going to). We recommend to order transfer for check in/out in advance as it's much easier than look for the car in the airport. All the transportation for daily trips it's better to order a day in advance. Airport Transfer $55 for 1-4 pax (one way- 3 hours). Rent a car (a driver and petrol are included) – $55 per day. Rent a scooter - $10 per day. We are providing you with a transportation, but all the entrance tickets you pay by yourself. We can organize you a guide if needed, a car and giving a piece of advice were you can go. We are not a tourist agency and do not charge any additional fees for this. For options of sight seeing please check in the chapter "Sight seeing"
In this tropical zone there are 2 seasons: Rainy season (December- February) and Dry season (March - November). This is according to the calendar, but it could be switched a bit. The rains are around 10-15 minutes per day 3-4 times per day. The temperature of water and air is 27-29 C (80,6 - 84,2 F) all year round. If you have a desire to help local people or schools, we can organize a meeting for you with local authorities, administration of a school or just with local families. parking lot offsite and a lovely garden.